Hammerhead 2019 Saturday 2nd March at Newark Showground in both The George Stephenson Exhibition Hall and the Gamers Lounge (Cerdic Ford Pavilion), which offer a welcoming environment with plenty of natural light in which you can play games, shop for wargame goodies from a selection of top traders positioned around the perimeter of the halls. 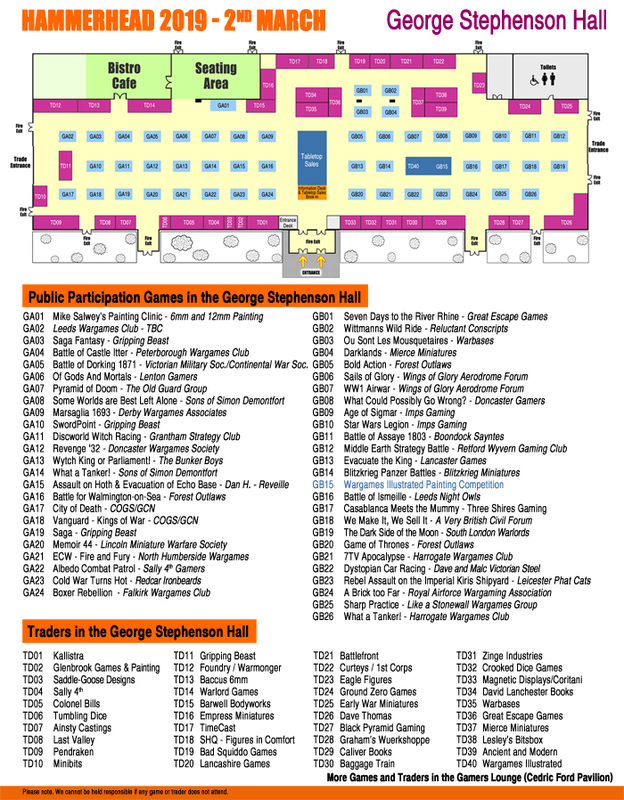 The 60 plus visitor participation games/activities are all located in the central area of the exhibition halls. It has two catering facilities, one in each hall, which will be serving a variety of reasonably priced hot and cold food throughout the day.The car parking is plentiful, free and Newark Showground is only a few minutes from the A1. Wargames Illustrated Painting competition is located in the George Stephenson Hall. So bring your painted Kallistra miniatures long! It's free to enter the WI painting competition. Please have pre-orders to us by Tuesday 26th February to ensure we can have your goods ready for you to collect from the Kallistra stand.